Summary: This article details research about rhetorical elements associated with statewide assessment scores, and it focuses on teacher-noted occurrences of voice in student writing. 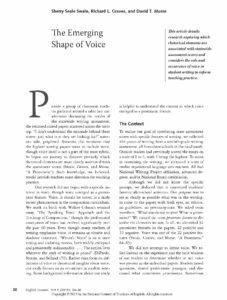 The authors also spotlight student writing excerpts that are demonstrative of voice, concluding that voice is hard to define and has a metaphoric quality, possibly that of “soul.” Because voice is often assessed in student writing (i.e., the 6 + 1 Traits of Writing), teachers often seek to find concrete ways to find voice or to model it. This resource can be helpful for teacher inquiry groups as a guide to finding examples of voice through an action research project. Any school or district-level inquiry team could use this research to support curriculum development or to help understand that voice grows through the composing process. “Voice grows out of the rich soil of student writing, not from drills or lectures or admonitions, not from workbooks or textbooks. Voice emerges in the course of the composing process, a by-product of the writer’s focus on content, purpose, diction, style, and audience. The key word is emerge. The creation of voice is not an end in itself but a by-product growing out of the process of writing. Preoccupation with voice shifts the point of view from ‘you’ to ‘I,’ from focus on audience to focus on self. Rhetorical features themselves are not voice. Voice is observed indirectly or intuitively through the rhetorical features. Since voice is observed indirectly, it follows then that the major teaching of voice should also be indirect.